An experience not to be missed when visiting Amsterdam! "We will never forget this special night out." 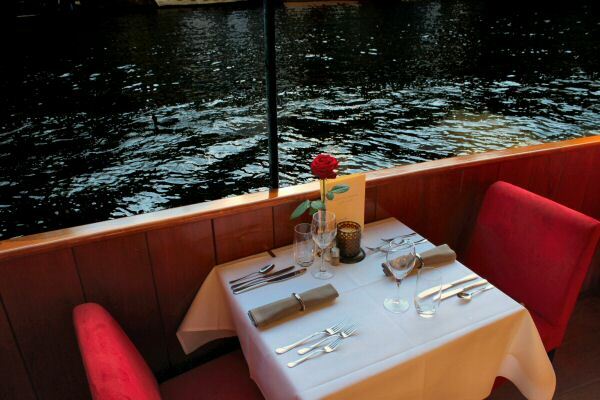 Enjoy a 3-course la carte dinner whilst cruising the world famous canals on an charming antique riverboat. The boat can be hired for your private/business event. Choose for a sit down or buffet style lunch or dinner or anything else you might like. Why Choose Amsterdam Jewel Cruises? We are very proud and thankful for the awards and recommendations. So a big thank you to all our guests who have taken the effort to write something nice about us! "One of our best Amsterdam memories is our dinner cruise boat tour. It was really a very special evening"